GOOD INTENTIONS VERGING ON SCAREMONGERING. There were people who told me to be careful around Indios Verdes and La Paz. Others have cautioned me to be on guard for upcoming MCM Project visits to Iztapalapa and Pantitlán. However, in terms of both quantity and seriousness those warnings pale into absolute and utter insignificance (slink sulkily into sombre shadows) when compared to what I’ve been told about Tepito. It was just yesterday, in fact, that I received the last of the warnings above. The ominous prediction came from my Juanacatlán friend Alejandro. So, when I woke up this morning I found that I couldn’t bear the suspense any longer. Curiosity had got the better of me. I made up my mind. Today I go to Tepito. PART II: WHAT I ENCOUNTERED ON ONE PARTICULAR DAY. I exit the station in the normal fashion, one stride after another. So far so good. I look to the right. Shady characters conducting a street side drug deal. I look to the left. A youth writhes on the pavement in agony, a victim of a stab wound or bullet penetration? And then, having already spotted my foreignness, a trio of heavies before me and closing in fast. HANG ON A MOMENT! REWIND! REWIND! Look, I don’t want to say that Tepito is a completely safe place and doesn’t have more underlying social and criminal problems than any other given neighbourhood. Reputations are usually founded in at least some element of fact. However, I certainly don’t want to perpetuate any false negative perceptions or misconceptions either. So, take two – the truth. Some street art. Rubbish and old clothes strewn on an overpass. I wandered over to a little plaza with some interesting murals. There I met local identity Luis Arevalo Venegas – Shoemaker forever. Born and bred in Tepito. 71 years strong. Only now, googling his name, do I get a better idea of just how well known in and around Tepito he is. Luis is the director of ‘Red de Espacios Culturales en Tepito‘ (Network of Tepito Cultural Spaces) which brings artistic and cultural activities as well as other services such as cut-price hairdressing to the public spaces of Tepito. He also runs a puppet workshop for disadvantaged children. You can watch a video of one of the workshops here. Busy man. Passionate man. He invited me back for a guided tour of the area. Very happy to have met him. Thank you Luis. 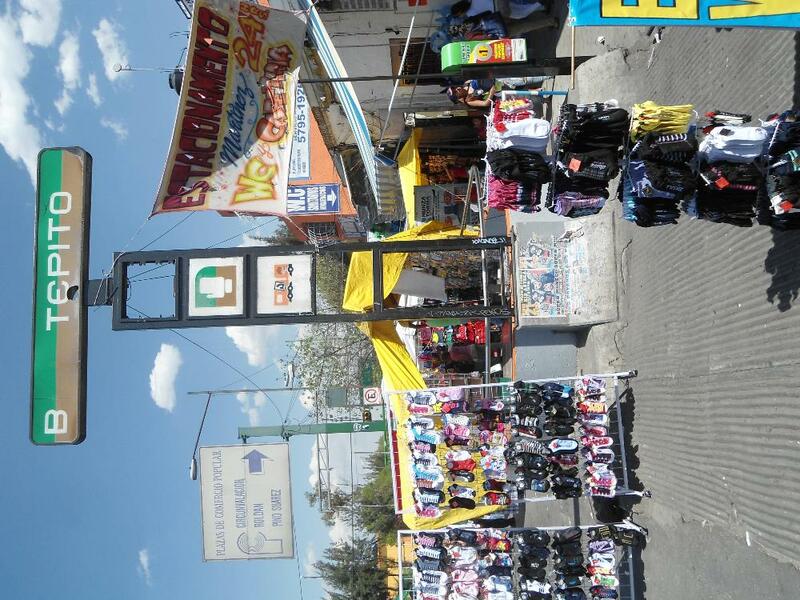 Tepito is well known for its elaborate street markets selling, well, what don’t they sell? Piracy is apparently a specialty. Tepito is also well known for boxing. Indeed the symbol of the station is a boxing glove. Like many ‘tough’ neighbourhoods around the world the area has produced many champions. There are quite a few murals of boxers in the zone. Along the way I also met Javier, a mobile spicy chicken wing vendor. He kept a steady pace at my side. We came to a halt and Javier explained the exact geographic delimitations of Tepito and handed over a free sample of one of his wings. Algunas personas me avisaron que tuviera cuidado alrededor de Indios Verdes y La Paz. Otras me han advertido por las visitas próximas a Iztapalapa y Pantitlán. Sin embargo, en términos de cantidad y gravedad, aquellas advertencias se redecen hasta la insignificancia absoluta y total ( se marchan subrepticiamente a sombras sombrios) cuando se comparan con lo qué la gente me ha dicho sobre Tepito. Fue ayer, de hecho, que recibí la última de las advertencias de arriba. La predicción siniestra vino de mi amigo de Juanacatlán, Alejandro. Así, cuando desperté hoy en la mañana encontré que ya no podía soportar el suspenso. La curiosidad me había vencido. Decidí. Hoy me voy a Tepito. Salgo de la estación en la manera normal. Un paso tras otro. Hasta ahora todo bien. Miro a la derecha. Personajes sospechos haciendo un negocio de drogas abiertamente en la calle. Miro a la izquierda. Un joven retorce en dolor en la acera, víctima de una puñalada o la pentración de una bala? Entonces, habiendo ya dado cuenta que soy extranjero, están a mi frente tres matónes acercandome con rapidez. ESPERE UN MOMENTO! REBOBINE! REBOBINE! Mira, no quiero decir que Tepito es un lugar completamente seguro y no tiene más problemas sociales y criminales subyacentes que cualquier otra colonia. Las reputaciones normalmente se fundan en, por lo menos, algún elemento de realidad. Sin embargo, indudablemente, tampoco quiero perpetuar percepciones negativas y falsas. Así que, empezando de nuevo – la verdad. Un poco de arte callejero. Basura y ropa vieja dispersada en un paso elevado. Fui a una plazuela con unas murales interesantes. Alli conocí a personaje local Luis Arevalo Venegas, zapatero por siempre. Puedes leer una entrevista con él aqui. Nacido y criado en Tepito. 71 años de fuerza. Solamente ahora, haciendo una busqueda de google, llevo un mejor idea de cuanto es conocido en y alrededor de Tepito. Luis es el director de la ‘Red de Espacios Culturales en Tepito‘ que trae actividades artisticas y culturales a los espacios públicos de Tepito así como ortos servicios como de peluquería muy barato. También está encargado de talleres de titeres para niños desfavorecidos. Puedes ver un video de uno de los talleres aqui. Hombre ocupado. Hombre apasionado. Me invitó a volver por un tur guiado. Muy contento de haberle conocido. Gracias Luis. Tepito es bien conocido por sus tianguis que venden, bueno, qué no venden? Aparentamente la piratería es una especialidad. También es conocido por el boxeo. El logotipo de la estación es una guante de boxeo. Como muchos barrios dificiles del mundo el área ha producido varios campeones. Hay varias murales de boxeadores también. En el camino también conoci a Javier, un vendedor ambulante de alitas de pollo picante. Mantuvo una velocidad estable a mi lado. Paramos y Javier explicó las delimitaciones exactas de Tepito y me dió una prueba gratuita de una de sus alitas. Mientras masticaba le dije ‘Muchas personas me han dicho que Tepito es peligroso. ¿Es así? As you recently read in my blog, I accidentally wandered into Tepito not knowing what it was, without any problems. My Mexican friends were pretty shocked at this, especially the young security guard who was from there working at my hostel. I asked him if I could go back alone, and he said no, but that he would take me during the day some time. While that never happened, I think it’s worth mentioning that a pretty tough looking dude from that area advised me not to go back. Glad to hear you had a good experience too. I loved this post man, very interesting! Thanks for the like! You don’t want to go there, the way it is right now. Even the police don’t. Global travel rule #1-avoid places avoided by the police. I know the owner of this blog he is a wanker who has never actually been to tepito. He’s visited the outskirts and that’s it. That’s funny. I don’t remember having met. Can you refresh my memory? I’ve also heard the horror stories and as a female, I wouldn’t go alone, though I have male friends, both foreign and Mexican, who go often for the cheap shopping. Thanks for the comment. Shopping is obviously the big drawcard for people – what can’t you get there? Safety in numbers you’re right, though I have mostly gone alone. There are plenty of people about, as you say the case for females is different to males, unfortunately. Excellent blog Pete…. I’m more acquainted with Puebla/ Tlaxcala area but go to Mexico City occasionally. Tepito is rough but everything you mentioned is true. I hear that nearby Lagunilla has an antique market on Sunday mornings…have you been? I’ve been in Tepito at least 10 times, most of the time alone – all during the day and have never felt threatened in any way. Recently I went on ‘safari en tepito’, a tour/play which was part of the centro historico festival- great insights into the neighbourhood. I haven’t been to the Lagunnilla antique market yet – will check it out sometime – saludos! I went to Tepito with a friend two days ago (we’re both Australians) and we were robbed at knifepoint 5 minutes after entering the market area. We are both very seasoned travellers who don’t go around dressed like tourists, flashing cameras or money around, etc. The robbery happened in broad daylight (noon) in front of many stall holders and bystanders. He only wanted our mobiles – which we handed over, obviously. So obviously experiences vary. I would go back, but only with Mexican friends. Of course experiences vary. Sorry to hear about your visit. Apart from the day I visited for my metro project I was probably there around 8 or 9 times, alone every time except for once. I never had any problems. With my Mexican friends in DF, the word “Tepito” never arises in conversation unaccompanied by many warnings of why not to go there. Rumor has it they’ll rob you of everything down to your undershorts. But as with all such rumors, it’s probably overstated. Where people have an overwrought sense of what exactly “dangerous” is. Tepito es una cosa de día , andando normal y sabiendo porque calles poder circular, tepito tiene su fama por ser un lugar muy feo como de delincuencia o como un pueblo sin ley, que no respetan a la autoridad, pero en la noche es otra cosa, si no eres de por hay no salgas di no te dejan sin nada poro tepito tiene sus lugares por donde visitar. I just read your entry on Tepito and enjoyed it very much, I think i will go check it myself too! Thanks for liking my blog. I enjoyed what you wrote about your visit to Tepito. Definitely the scene could be repeated all around the world, and Javier’s comment is so true! I like how you wrote the story in two languages. Turned out that my visit to Tepito and subsequent blog entry was the most read/viewed of all the stations that I visited so 5 months on here it is at the top of the page again! I never got to Tepito but I, like you, received lots of mixed advice. Some people said “never go there” others said “eh, its not so bad”. Generally most people said keep your wits about your and don’t flash cash around which is pretty solid advice for everywhere really. I have heard you can buy absolutely anything there. Yep, it’s a pretty crowded and intense commercial zone! Referente a tus próximas visitas , te puedo decir que la zona de iztapalapa, es algo parecido a Tepito, tiene sus contrastes no todo es peligro, yo pertenezco a esta zona, pero no del centro de iztapalapa, que es el punto neuralgico, sino del otro lado que es mucho más tranquilo. (Av. Tláhuac) pero es como todo, pasando lo peor, lo demás no es nada. Estoy de acuerdo con Javier, considero que la mayoria de la gente que vive en Tepito, es trabajadora,buena y con ganas de superarse, por mencionar al reconocido boxeador el ” RATÓN MACIAS” y muchos otros personajes destacados como tú mencionas, lamentablemente otros que se han dedicado a manchar el nombre de Tepito, que por cierto su significado es: ( Pequeño templo, capilla o ermita ) de origen NAHUATL. Se dice que en tiempos Prehispánicos, sus habitantes eran sometidos por el dominio de los Aztecas, quienes impedian canalizar sus mercancias en el mercado de Tlatelolco así que decidieron crear su propio recinto comercial fuera de Tenochtitlán, de ahí que los ladrones concurrieran a este sitio para vender sus productos robados. Y bueno, que decir de tu desición de constatar por propio pie, lo que es realmente el contraste de Tepito. Que miedo por lo que pasaste y que bueno que estes bien. I did stroll through Tepito once. By accident. Testing out a new camera…not the most massively sensible thing I ever did there. I’ve been to the Thieves market too, a couple of times. I never felt in any danger. But I didn’t take any valuables either. It’s best not to be strolling around there after dark. Felt totally safe at all times around there. Maybe a different story after dark.